What is the EDATE Function? The EDATE Function is categorized under DATE/TIME FunctionsFunctionsList of the most important Excel functions for financial analysts. This cheat sheet covers 100s of functions that are critical to know as an Excel analyst. The function helps add a specified number of months to a date and returns the result as a serial date. Apart from helping a financial analystFinancial Analyst Job DescriptionSee a real Financial Analyst Job Description including all the skills, experience, and education required to be the successful candidate for the job. Perform financial forecasting, reporting, and operational metrics tracking, analyze financial data, create financial models calculate maturity dates for accounts payable or accounts payable that fall on the last day of the month, the EDATE function also helps in calculating summary count by month. Start_date (required argument) – It is the initial date. 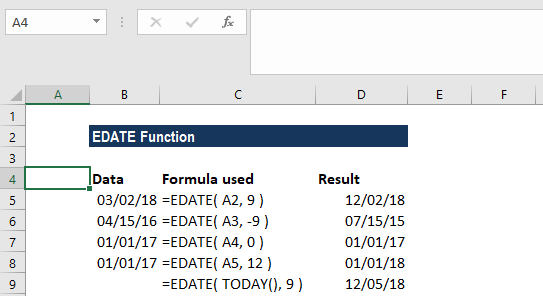 We need to enter dates in date format, either by using the DATE function or as results of other formulas or functions. For example, use DATE(2017,5,24) for May 24, 2017. The function will return errors if dates are entered as text., as interprets text representations of dates differently, depending on the date interpretation settings on the computer. Months (required argument) – It is the number of months before or after the start_date. A positive value for months yields a future date; a negative value produces a past date. 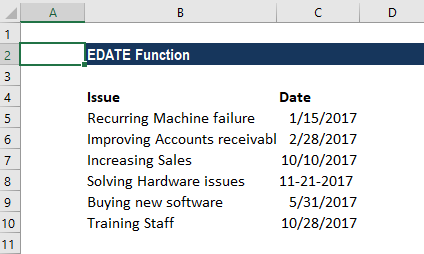 How to use the EDATE Function in Excel? In Row 2, the function returned a date that is 9 months after the start date. In Row 3 it returned a day that is 9 months before the start date. In row 4 as we were given months as zero, so it returned the date same as start date. Whereas in row 6, we used Today function along with EDATE function. So, it returned a date that is 8 months from today. Remember that the EDATE function will return a serial date value. A serial date is how Excel stores dates internally and it represents the number of days since January 1, 1900. Assume we are a start-up and just like the rest, we also face several issues. So, we came up with a list of issues and due dates by which we would solve them. If we wish to create a summary count by month, we can use COUNTIF and EDATE. As seen above, we assigned due dates to tasks/issues listed above. 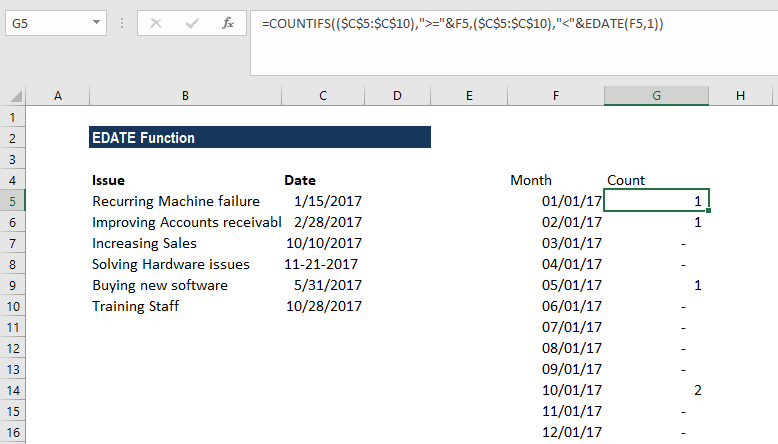 To create a summary by month, we can use the formula involving COUNTIFS and EDATE. The formula to use is =COUNTIFS(($B$3:$B$8),”>=”&E3,($B$3:$B$8),”<“&EDATE(E3,1)). In the example above, we see a list of six tasks in Column A, each with a corresponding target date. From column E, we get a summary table that shows a total count per month. The first column of the summary table is a date for the first of each month in 2017. Now in formulas, for COUNTIFS, we need to supply the criteria that capture all data by date. To generate a total count per month, we need the criteria that counts all tasks to be completed in an entire year by month. The formula above is roughly translated as “dates greater than or equal to the date in E5 and less than the date in E5 plus one month.” It is a convenient way to generate “brackets” for each month with one date only. COUNTIFS generates the correct count for each month. Remember that if we do not wish to see full dates in column E, we can apply the custom date formats “mmm” or “mmmm” to display month names only. #NUM! error – Occurs when the date resulting from the calculation is not a valid date. Any of the supplied arguments are non-numeric. If we provide a decimal value for months, the EOMONTH function will only add the integer portion to start_date.